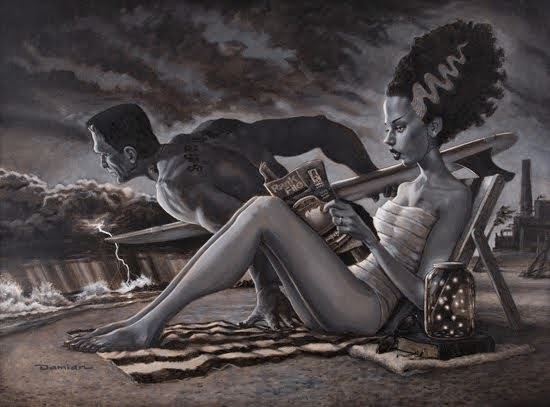 One of the reasons I renamed "The Wednesday Theme" as "The Pops Gallery" was so that I could post these collections of images more than one day a week. 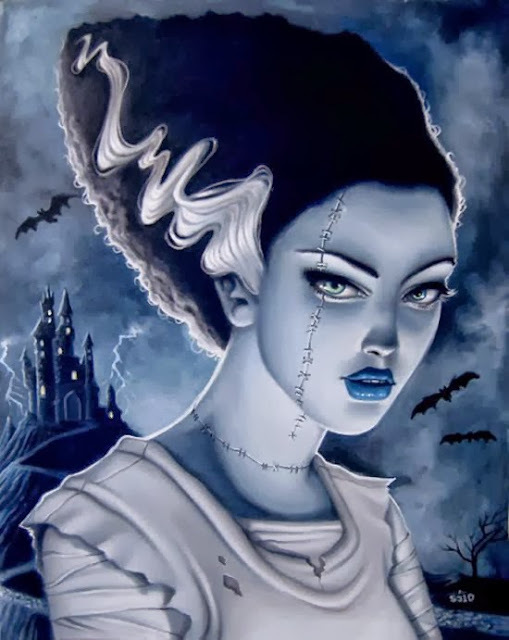 Especially with Halloween coming, I have a number of topics that have been sitting on my hard drive since last October that I want to get out there so I can start working on my Christmas compilations! 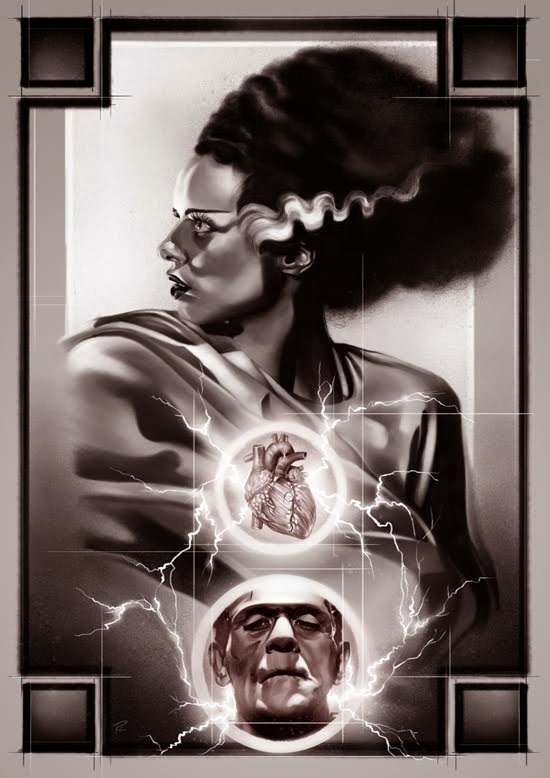 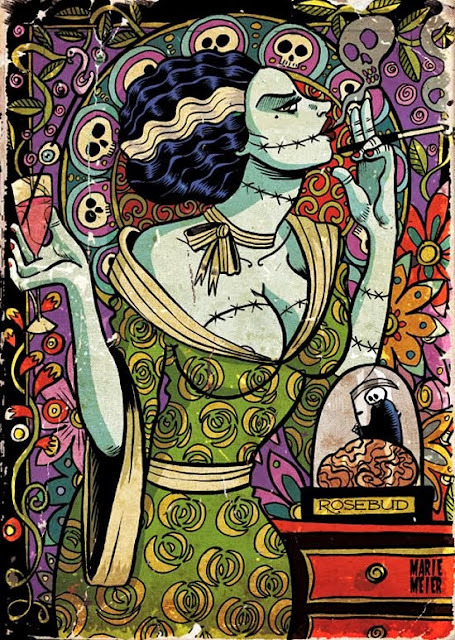 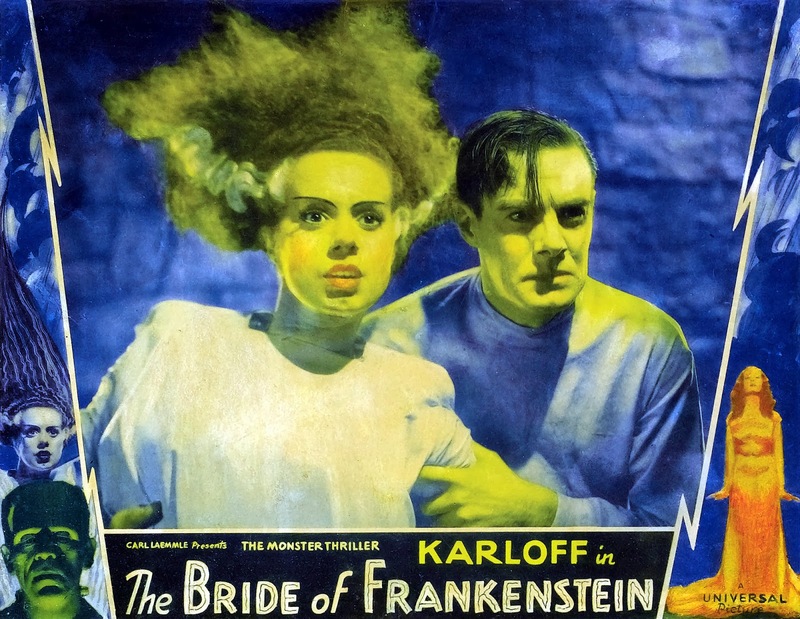 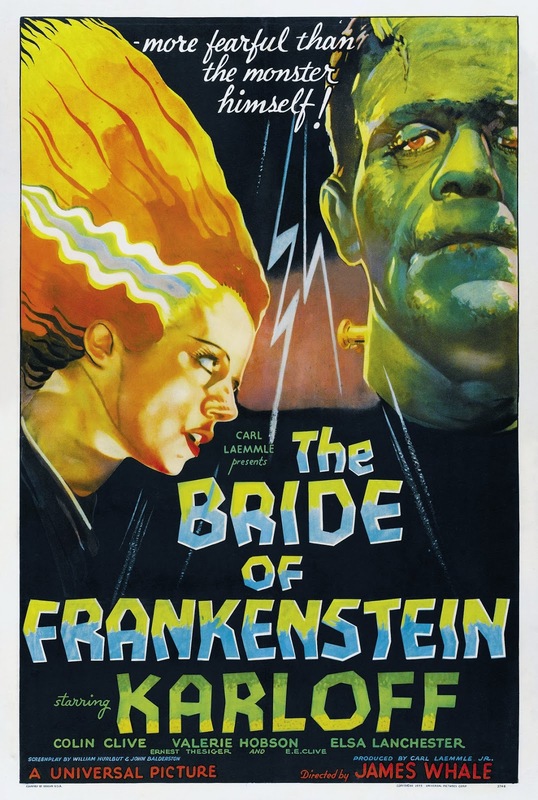 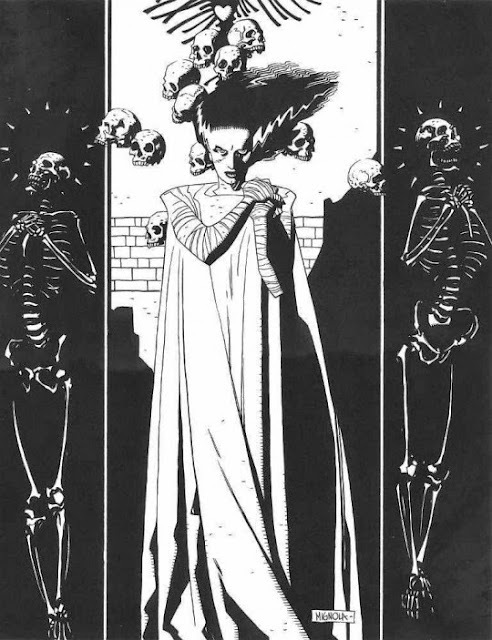 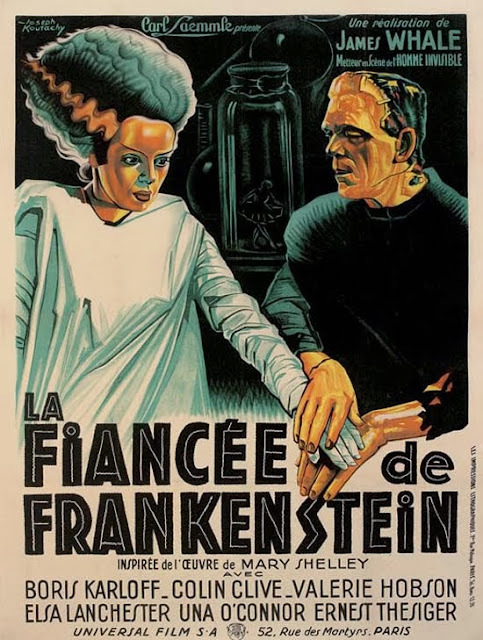 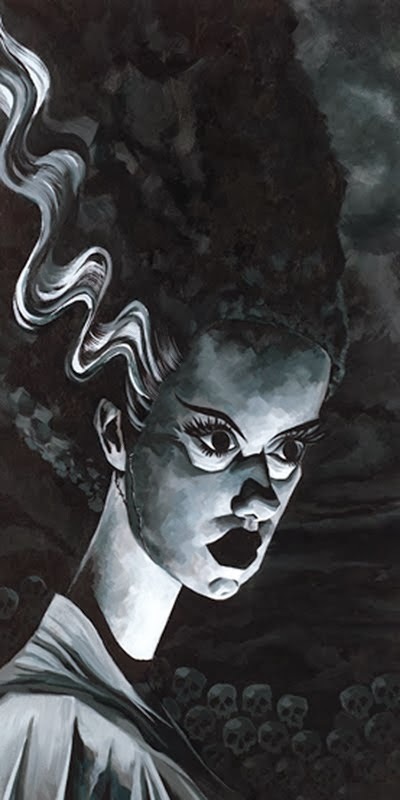 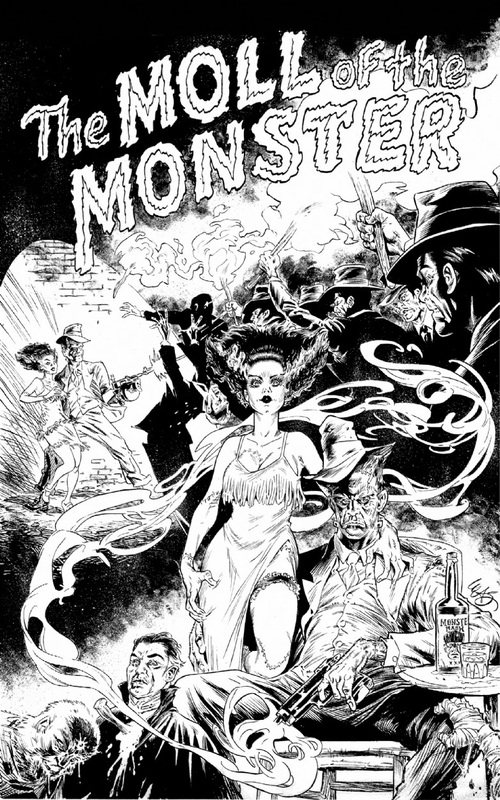 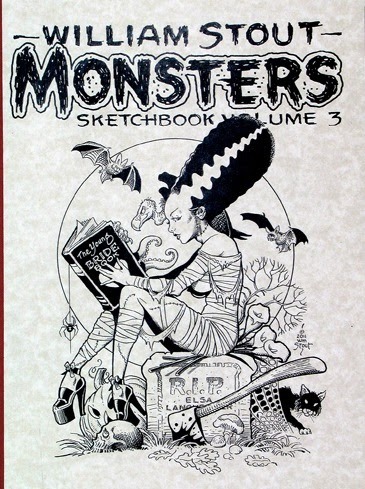 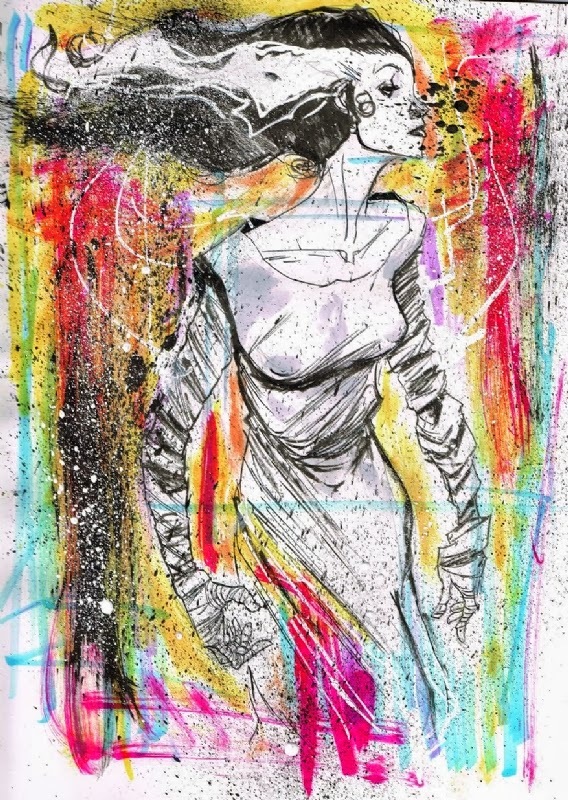 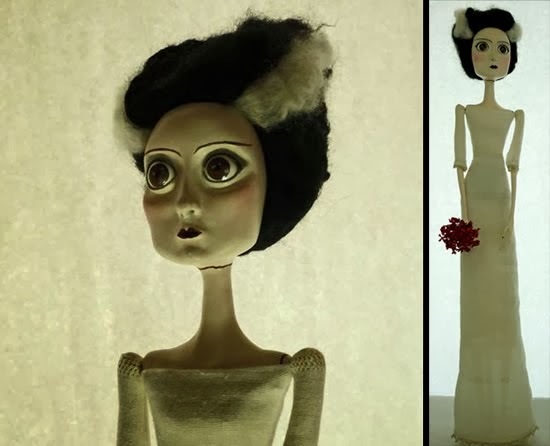 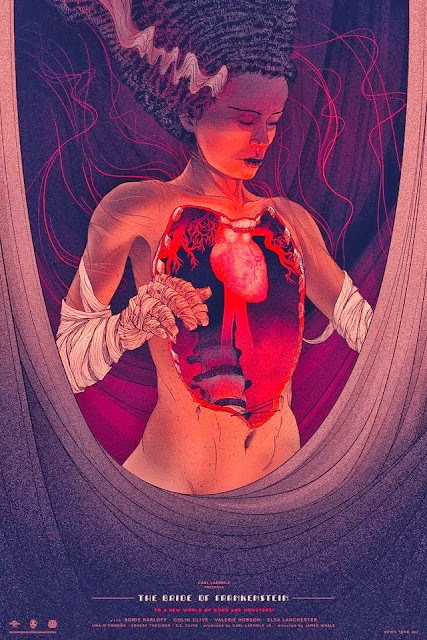 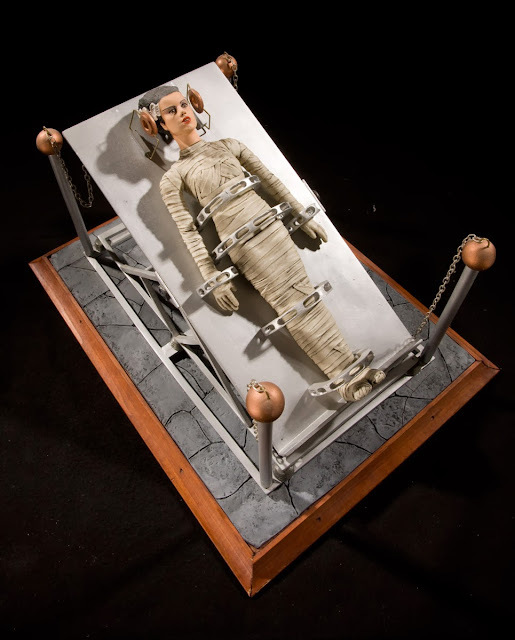 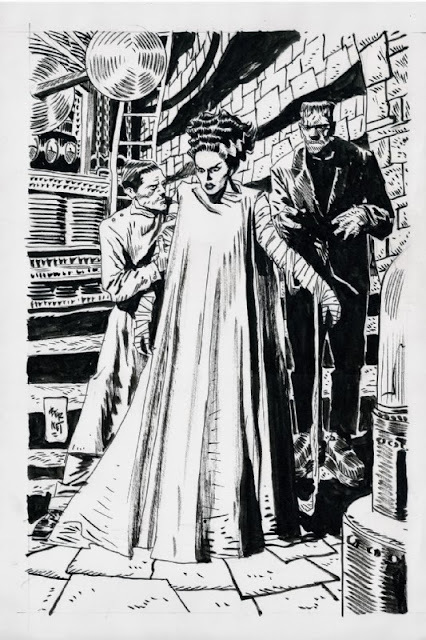 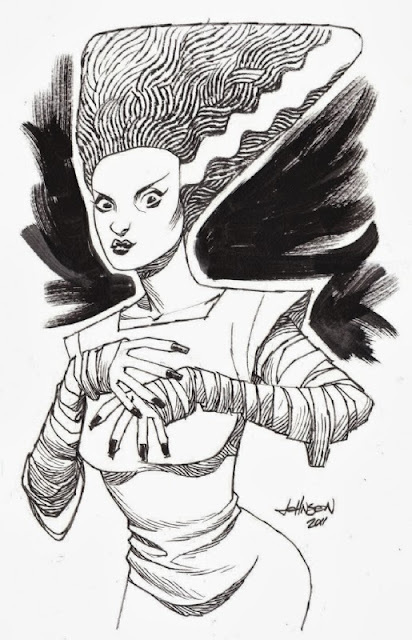 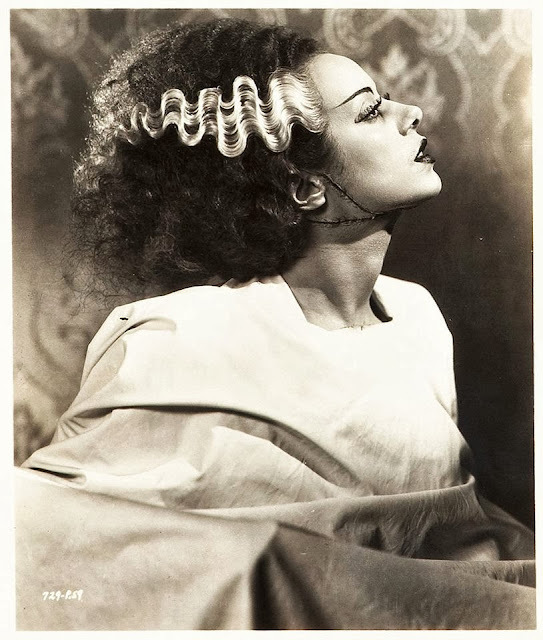 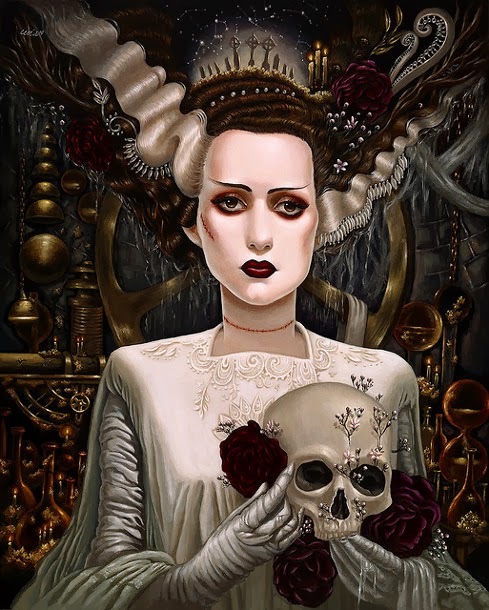 Of the hundreds of characters in the horror genre that have served as inspiration to artists over the years, few are as iconic as THE BRIDE OF FRANKENSTEIN. 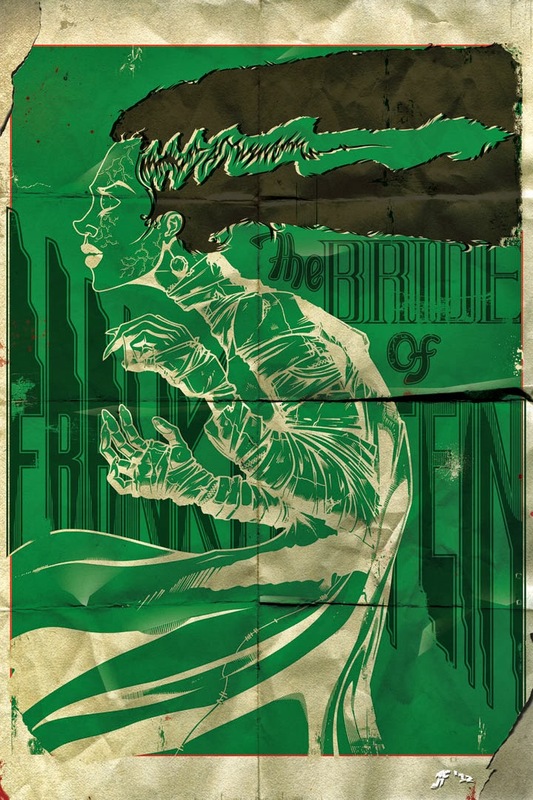 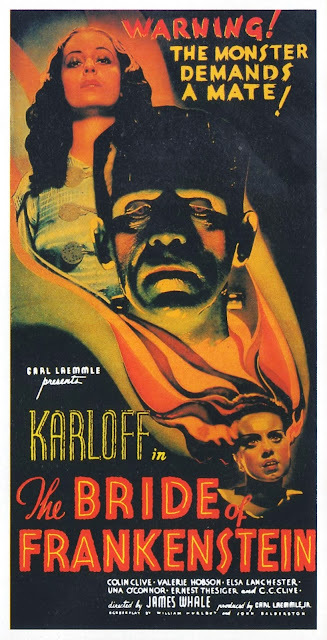 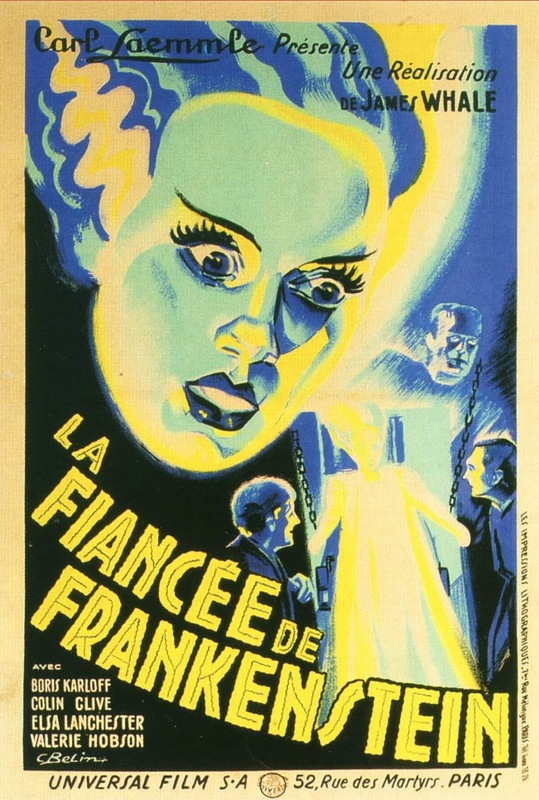 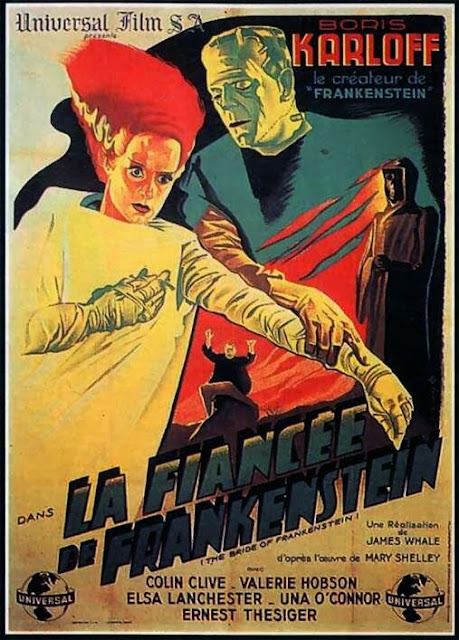 Many critics consider James Whale's 1935 sequel to Universal's smash adaptation of Mary Shelley's FRANKENSTEIN to be a superior film to the original. 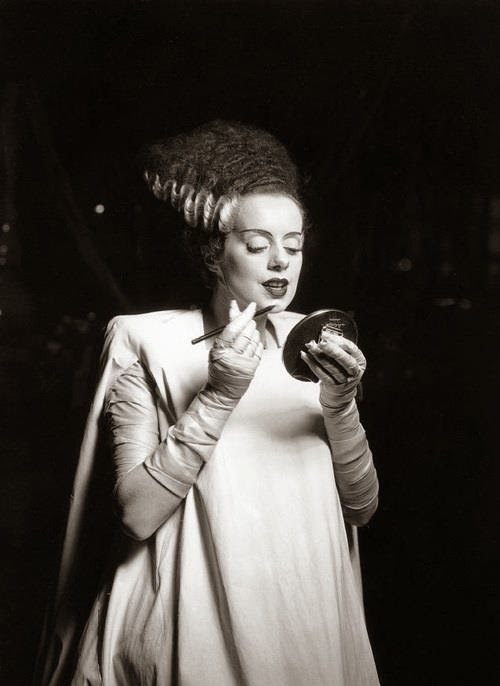 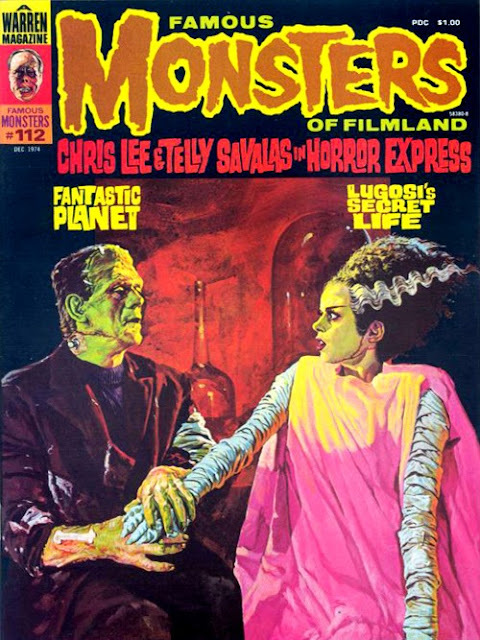 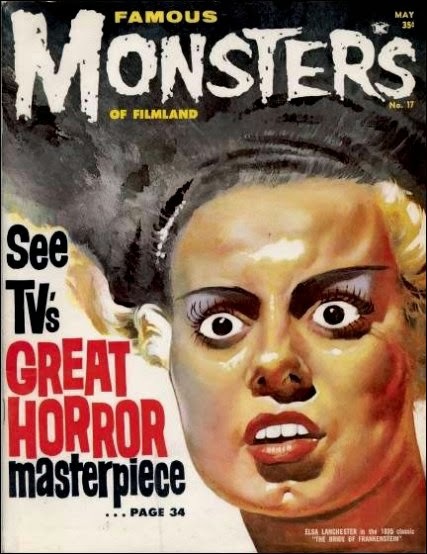 It's certainly one of the most striking movies of the era, and one of the main reasons is Elsa Lanchester's performance as the titular mate for the monster. 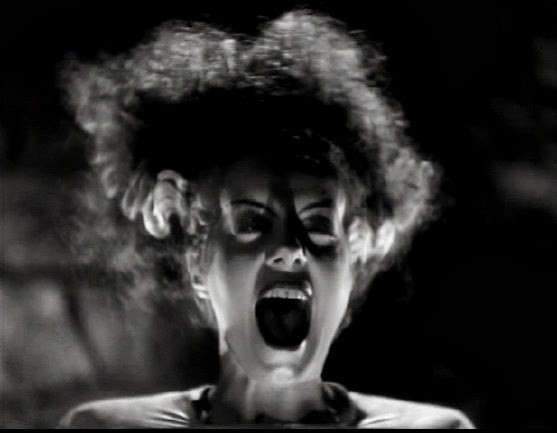 Makeup artist Jack Pierce (working closely with director Whale) created one of the most striking characters in film history. 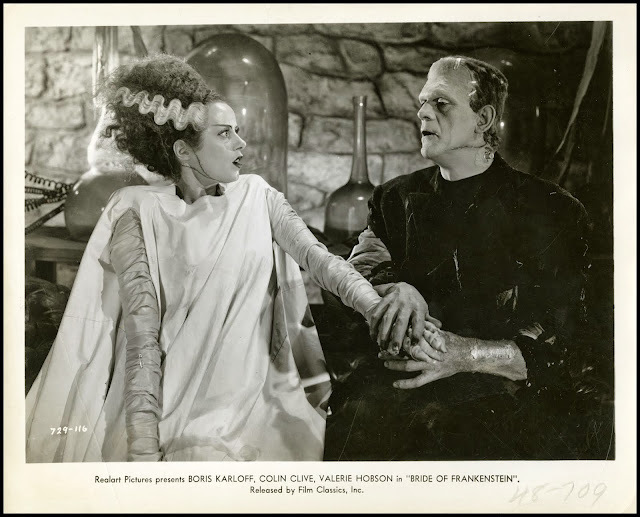 The 34 year old British actress may not have enjoyed working with the egotistical artist, but the results (based in part on the Egyptian queen Nefertiti) were arguably as indelible as the image of Boris Karloff's monster. Hardly as hideous as her "husband," the Bride was basically a gorgeous woman with a zany hairstyle and some pretty startling scars under her neck. 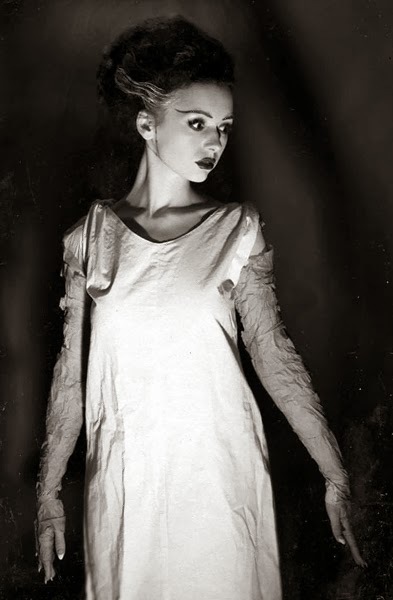 Her simple garments—a white sheeted dress and bandages—add to the starkness of the image. 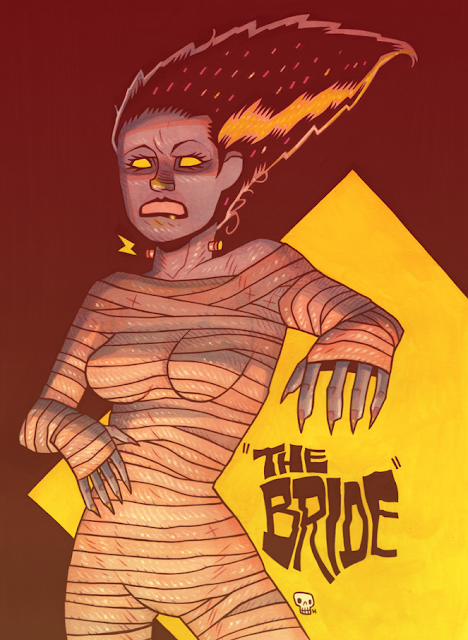 What people often fail to remember is that the Bride is barely in the film. 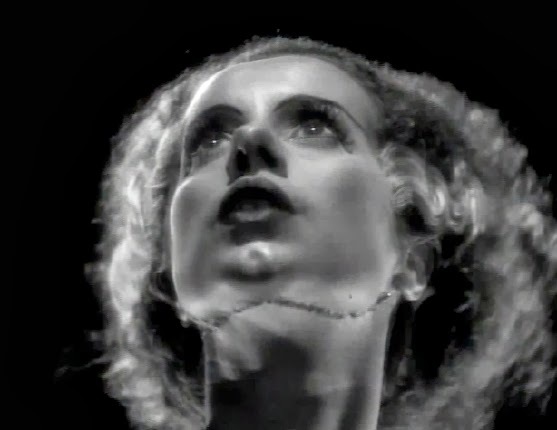 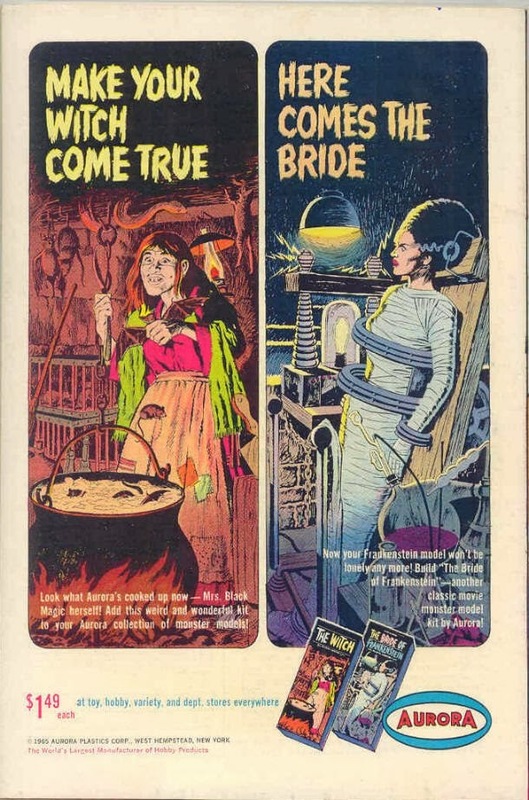 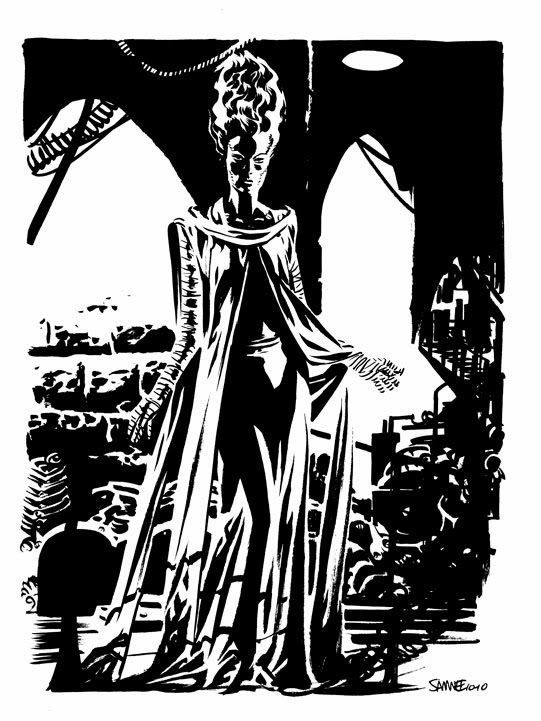 She pops up in only the last five minutes of the movie, rejecting her intended with a swan-inspired hiss and prompting another fiery unhappy ending for the mad doctor and his creations. 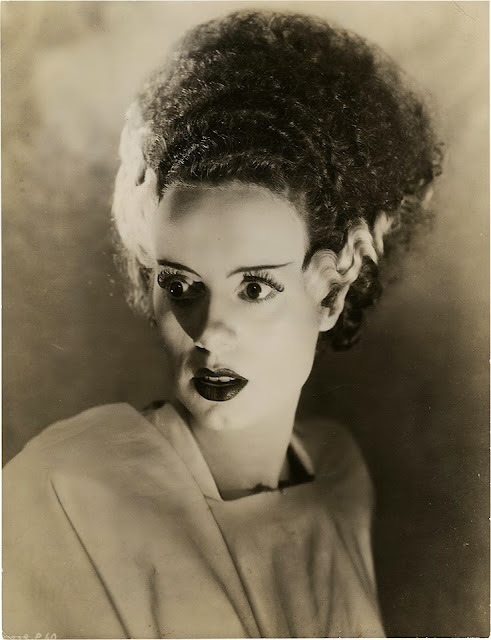 But no matter. 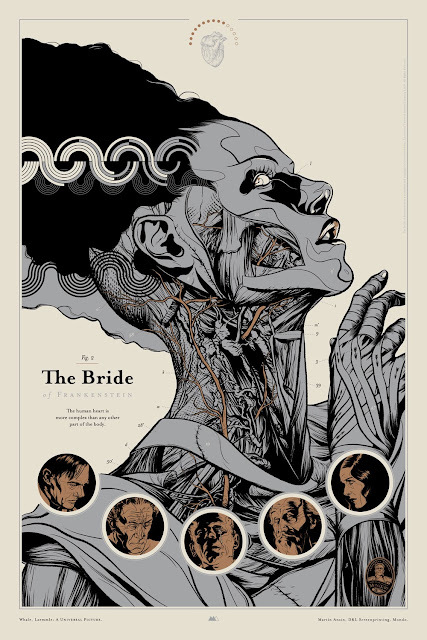 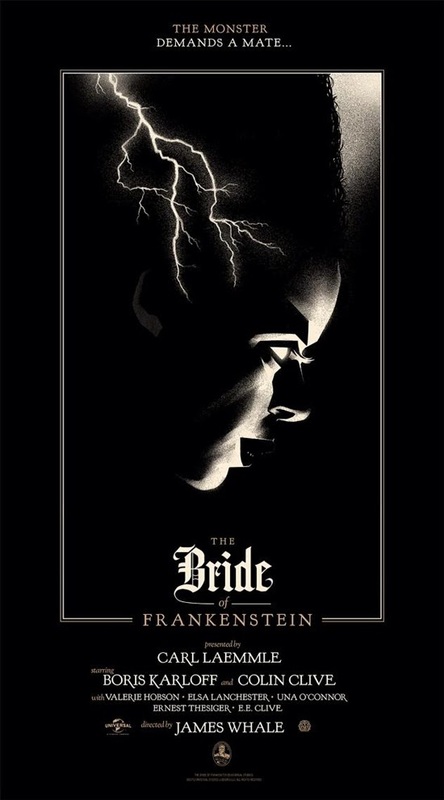 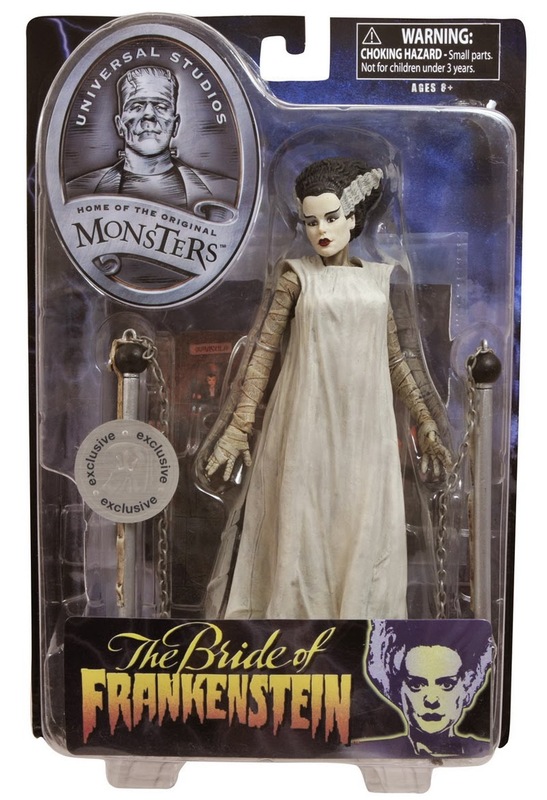 The Bride of Frankenstein is as legendary as the Monster, Dracula, the Wolfman, or any of the classic Universal monsters. 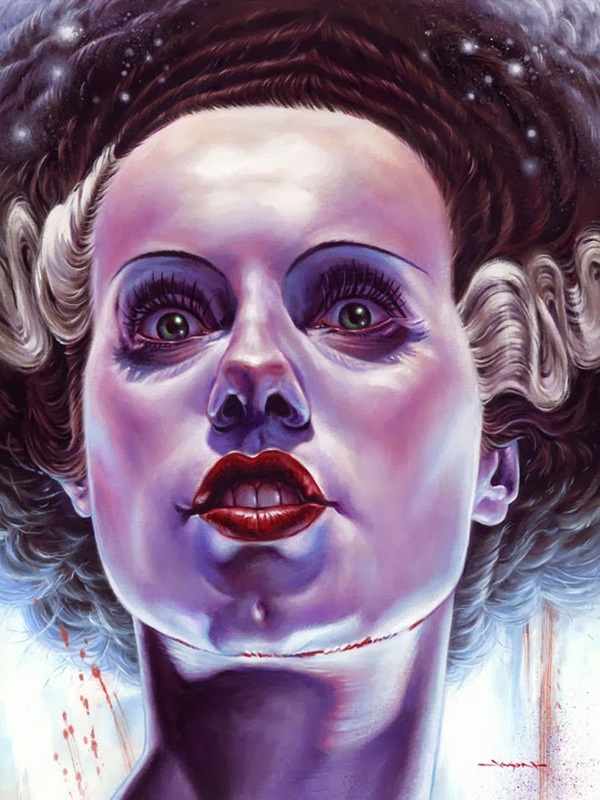 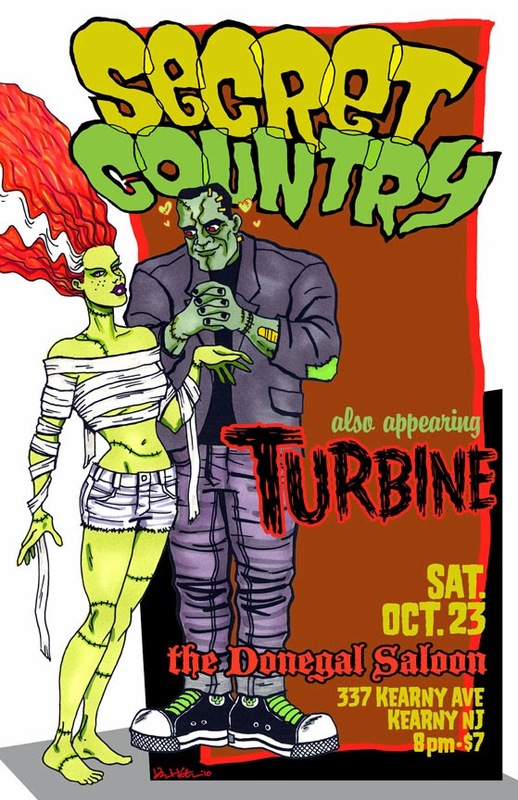 Below is a collection of posters, stills, merchandise, and modern interpretations of this classic amalgamation of horror and glamour. 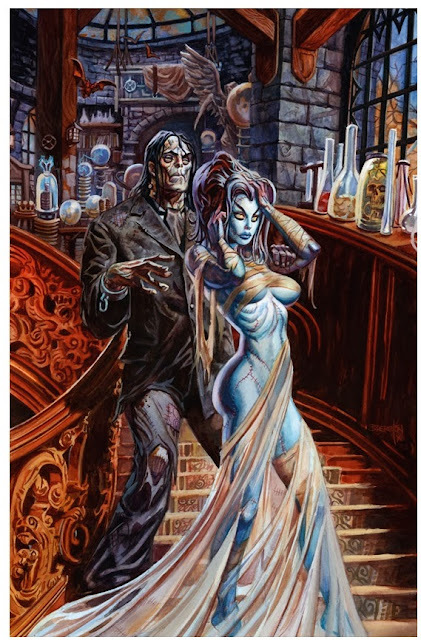 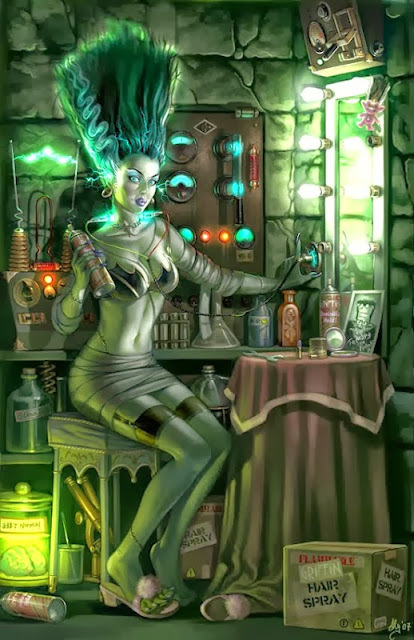 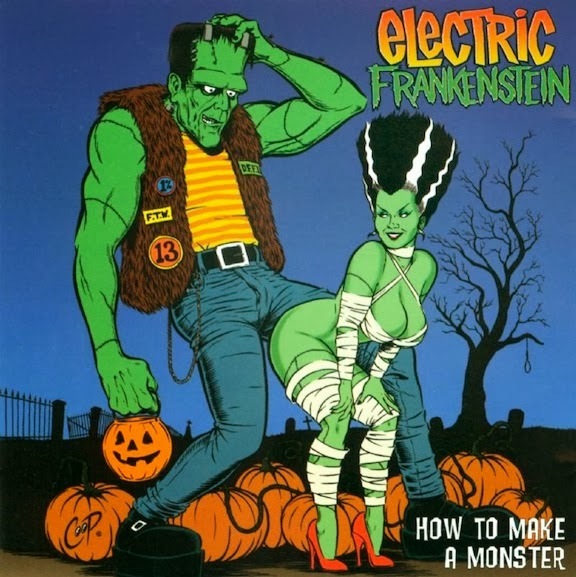 For much more check out the amazing FRANKENSTEINIA blog. 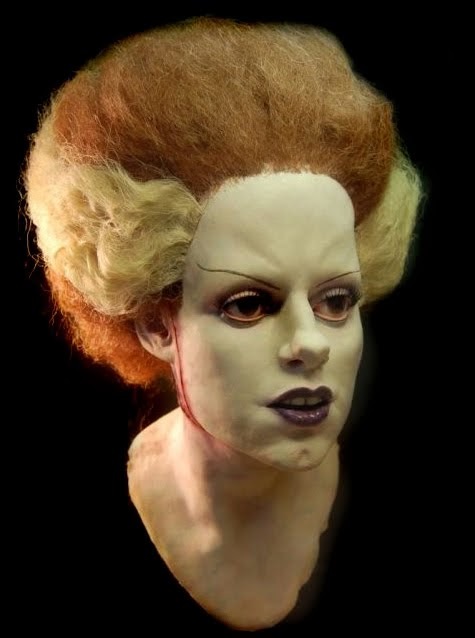 The Pops Gallery: Ben Cooper Costumes!